NFSB Continuing Education » ‘Talent Club’ jams at NOVA! Nova’s Adult General Education teacher, Andrey Kutash, is offering a lunch hour activity all about celebrating talent. He decided to make it broader than previous years` music clubs in order to cast a wider net and attract more students. It worked! Last week, 12 students participated. The group included the S.I.S. (Social Integration Services) class along with their teacher, Katie Cashion. As Adult General Education teachers Colleen Glover and Andrey Kutash, provided the musical instruments. Students choose the activities of the talent club when they arrive. For example, last week the “Jam session” featured: Juane Descartes playing lovely pieces on recently donated keyboard; Matthew Moses jammed out on the electric guitar; Rebecca Elsmore banged out on the electronic drum kit. 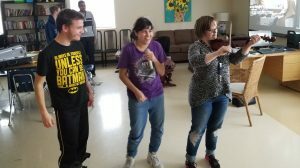 Melody Brazeau, Anita Opeh and Daisy Borrello sang Karaoke and Charlene Owen played the violin. The NOVA Talent Club meets every Tuesday from 11:30 to 12:30 in room 2-016.